Okay to Use Flea Shampoo on Sensitive Skin? What Flea Shampoo to Use on a Puppy? One of the best feelings in the world is to come home from a long day of work, open the door, and have your dog jump at you in joy. Hugging a dog has been proven to provide stress relief and comfort, and what better way to unwind than to bury your face in the fur of your four-legged friend? In theory, this sounds like a dream. However, that dream scenario quickly comes crashing down the day your dog acquires unwelcome inhabitants – fleas, or worse, ticks. Hugging the dog suddenly doesn’t sound so tempting, does it? Fleas can come from anywhere, at any time, and are often hard to get rid of. A tick can crawl onto your dog during a quick morning walk, crawl off again in the dog’s bedding inside the house, lay little flea eggs and multiply at an alarming speed. This is, for obvious reasons, something a loving owner will want to avoid at all costs. One good way to prevent- as well as combat fleas and ticks, is by regular use of a reliable flea shampoo for dogs, as well as anti-flea powder for your carpet. With today’s easy access to quality products from all over the globe, it has most definitely gotten easier to access these products, but harder to choose. Here is a list of 10 of the best flea and tick shampoos for dogs living under your roof. Help keep your snuggle-buddy plague free, so that you can hug and cuddle for as much as you like! You may also be interested in one of these effective flea collars for dogs! This flea killing shampoo for dogs is made with botanical ingredients; peppermint oil being one component, and it is 100% free of sulfates, synthetic pesticides, and harsh chemicals. The unique blend of geraniol and peppermint oil is scientifically proven to repel fleas and ticks, as well as flea eggs and larva. A bath with this flea puppy shampoo 1-2 times per month is enough to keep our adorable dog friends protected and safe from infestation. It can also be used on felines, so for the person looking for the best flea shampoo for cats – this would be a good option. This flea control shampoo is safe to use on puppies and kittens over four months old. Why We Liked It – Great for pet parents who share their home with dogs and cats, as this pet flea shampoo can safely be used on both. An extra plus for being chemical free and nicely scented! When looking for the best dog shampoo for fleas and ticks, it is important to find a product that gets rid of fleas – those highly unpleasant critters, while also being gentle on the dog’s skin and coat. Chemicals can cause irritation and allergies, which is why this shampoo for killing the fleas on your dog, and other creepy crawlers has focused on using only naturally repelling components. Lavender, a natural anti-flea ingredient, drives those nightmarish miniature insects right off the dog and keeps them off for several days to come. This tick shampoo with Oatmeal is paraben free, tear free, odor controlling and recommended by veterinarians, while also keeping the dog’s coat soft, shiny and healthy. It is a suitable flea shampoo for puppies and growing dogs, thanks to its well-balanced formula. 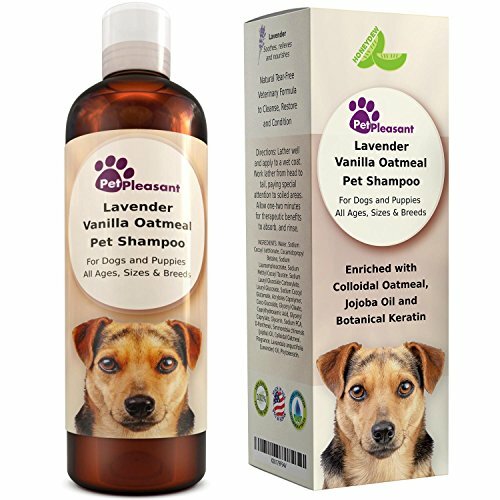 Why We Liked It – It is great to see more products focusing on eliminating chemicals and other ingredients that can cause skin irritation, such as this one, as it makes it possible to find the best flea and tick shampoo with Oatmeal, for dogs without harming their skin and coat. 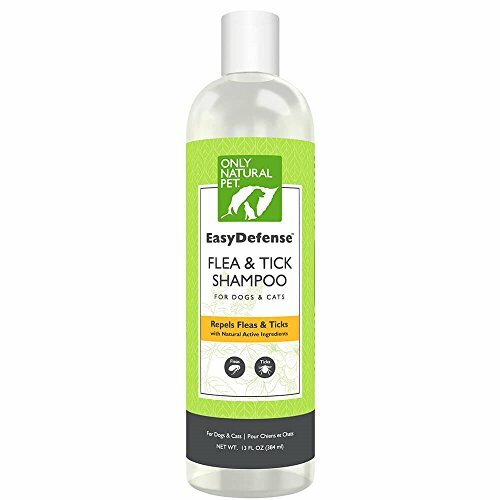 When looking for a flea and tick shampoo that works, many buyers just want something simple and affordable, yet effective. 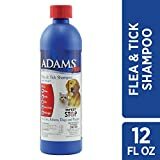 The Adams Plus Flea and Tick Shampoo with Precor for dogs does the deed and provides the dog with 28 days of flea control and tick repelling effects after bathing. 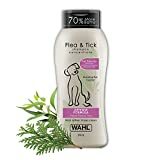 This flea and tick control shampoo contains aloe, oatmeal, and coconut extract, all known to soothe irritated dog skin – perfect for pets already suffering from itchy flea infestations. It is considered a top flea shampoo for dogs and cats of all ages, removing creepy crawlers, but also dandruff, scales, and dirt. 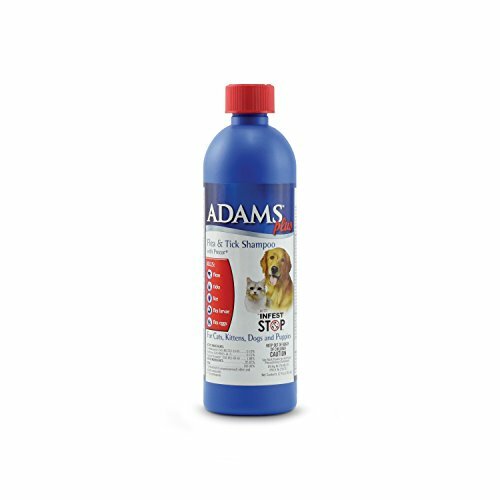 Why We Liked It – The long-lasting repelling effect of this Adams Plus flea shampoo for dogs is superior to many other similar products, while also providing relief for dogs with itchy skin due to scratching. A dog flea shampoo suitable for both puppies and adult dogs. It is often difficult to determine the best flea shampoo for puppies; as the younger the dog, the more sensitive is their skin and coat to chemicals and harsh ingredients. 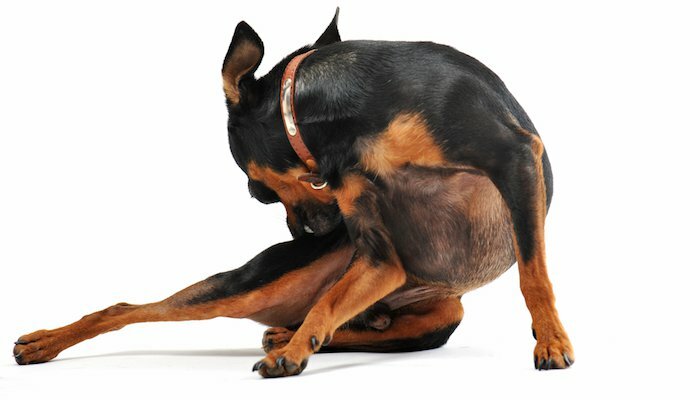 This flea control and killing shampoo will naturally repel fleas and bloodsuckers, using plant-derived ingredients such as cedar oil, mint and rosemary to do the deed. The tick dog shampoo has a foamy consistency and lathers nicely when used, leaving the dog’s fur smooth and shiny. The repelling effect lasts for a week, which is less than with some other products, but also what can be expected of a product which uses only natural ingredients, instead of chemicals. Why We Liked It – Constantly looking out for the best natural dog flea shampoo, we consider this option to be great for pet owners who prefer not to use chemicals to keep their furry friend bug free. This product is not just a good flea shampoo for dogs, but it is a shampoo meticulously tested and developed to help treat a variety of skin conditions. It is ideal for dogs with skin fungal infections, parasitic infections and a type of rash known as Seborrhea, as it treats scaling and promotes a quicker healing process with ingredients such as Micronized Sulfur and Salicylic Acid. 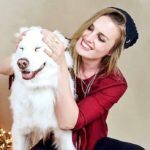 The company provides high-quality pet products at an affordable price, aiming at making good skin care available for dogs and puppies worldwide. 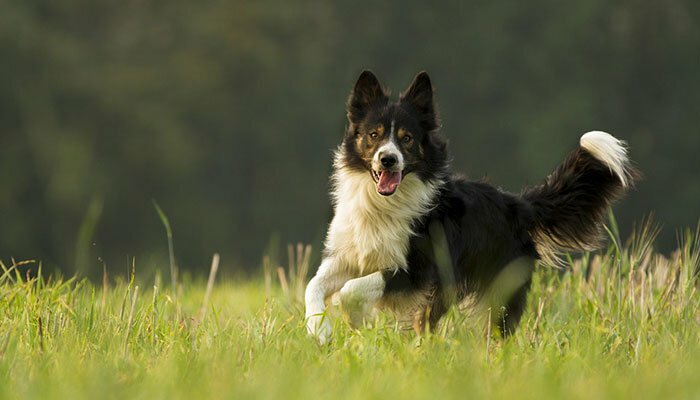 Its primary purpose is not to kill or prevent ticks and fleas on your dog, but it is an added plus as the product has proven effective when it comes to treating various skin issues and plagues. Why We Liked It – For dogs and puppies with skin problems, this flea tick dog shampoo presents the opportunity to kill two birds with one stone. Why not treat it all at once while also keeping fleas and ticks off? This shampoo is effective in killing the fleas on your dog – hoorah! With its unique Hawaiian Ginger scent, this product makes the ‘best flea killing shampoo for dogs’ list due to its continuous praise in dog flea shampoo reviews. It is PH balanced, to make sure your dog’s coat isn’t damaged when treating and preventing flea and tick infestations. 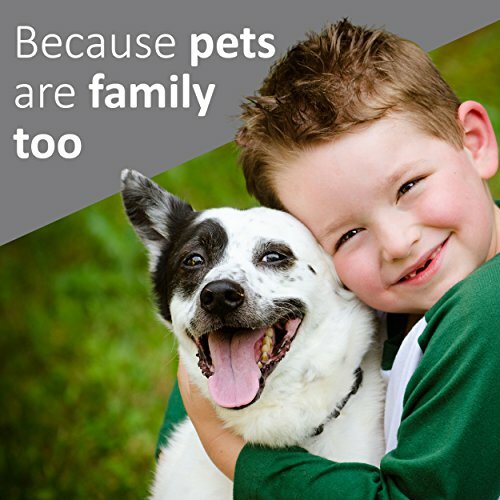 The price of Sentry’s flea and tick shampoo for pets is among the absolute lowest on the market, which helps ensure that the family dog stays huggable without it ruining the weekly budget. It should never be a cost issue, whether to keep your dog tick and flea free or not, which this anti-flea shampoo has taken aim at. The Sentry Oatmeal Flea And Tick shampoo continues to kill and prevent bugs for 10 consecutive days following treatment, making sure those critters don’t crawl right back onto the dog. 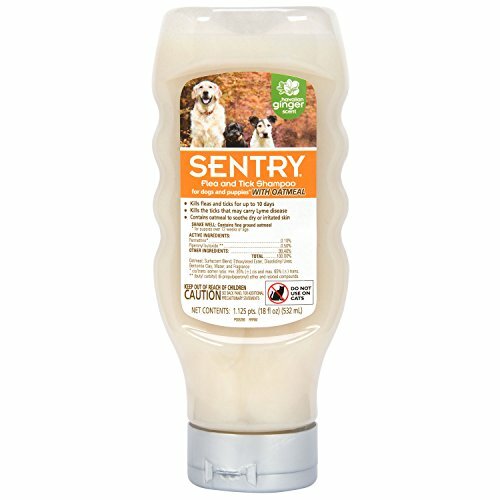 Why We Liked It – This Sentry Oatmeal Flea And Tick shampoo is a very cheap alternative for killing the unwanted tick and flea infestations. Great to have the option of buying larger bottles for those with multiple dogs or an urgent need for continuous flea and tick control. The search for the best flea and tick shampoo is likely to take a devoted and well-informed dog owner past this product. This, differentiating it from many others, is not a prevention product, but instead, a product fully focused on eliminating ticks and fleas on your dog. The brand offers a different shampoo variety for prevention. 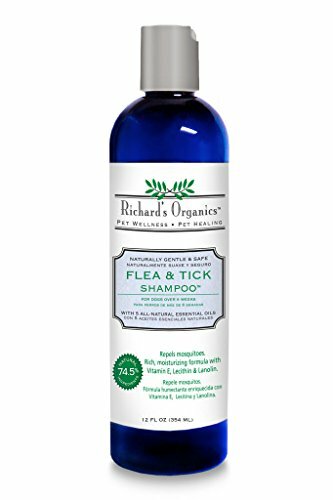 Due to having specialized specifically in tick and flea removal, this might possibly be one of the best flea control shampoos for those with heavily infested dogs and puppies. 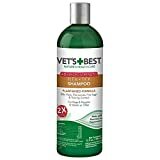 While aggressive in its way of dealing with small bloodsuckers, this shampoo leaves the dog’s coat smooth, soft and full of life, and leaves it smelling fresh for several days. Why We Liked It – It can be ridiculously difficult to get rid of ticks and fleas once they’ve made themselves at home in your dog’s fur, and this great-smelling shampoo is that power option you can turn to when you are starting to give up hope. An effective flea shampoo for dogs, which also repels mosquitos! Give your dog the best flea bath he or she has ever had, where active ingredients work to treat, cure and repel anything that might be crawling around on that furry family member’s body. Use it before a hike or a walk in the woods, to make sure the pupster comes back as insect free as he went out. This tick control product helps to promote healthy skin by combating dry patches, soothe and treat hot spots, dermatitis, itchiness and hair loss, all thanks to its unique blend of essential oils. It contains a mix of peppermint oil, purified water, and vitamin E, as well as cinnamon-, rosemary- and cedarwood oils. It can be considered a good anti-flea shampoo for all ages, as it can safely be used on puppies over 12 weeks of age. Why We Liked It – The company provides a clear ingredient list, showing off the product’s natural flea fighting components to help the customer decide if this is the best natural flea and tick shampoo for those adored pups at home. 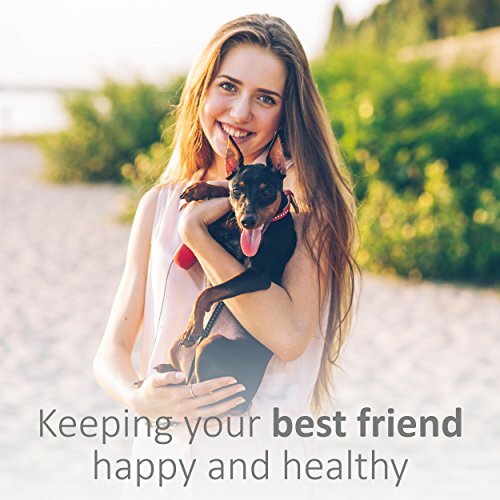 It offers a wide range of pet care benefits with every use, something that sets it apart from many other dog flea control shampoos. Here we have a product that aims to provide the best tick pet shampoo for dogs and cats – separately! The company sells one product for dogs and a separate one for cats, making sure that each product is properly adapted to the needs of its user. 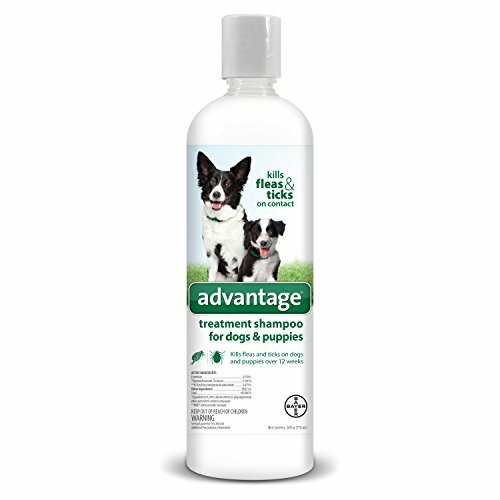 This tick pet shampoo is strong and effective in combatting insect infestations, and treatment should not be repeated with less than 7 days apart or on puppies younger than 12 weeks. When going through best dog flea shampoo reviews, it becomes clear that this is a product that delivers on its promises. 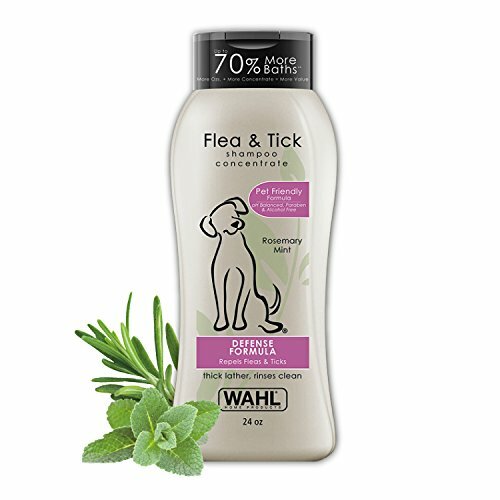 It is an anti-flea shampoo to be used when there is already a suspicion of fleas or ticks, to kill them off and leave the dog tick and flea free as quickly as possible. Why We Liked It – Sometimes it isn’t enough with just a preventive product, and this tick pet shampoo takes flea and tick extermination to a whole new level – perfect for more resistant cases of creepy crawlers, and for those little bugs that just won’t go away. Gold Medal is a brand with a variety of dog shampoos available on the market and among them their Flea & Tick Shampoo. This shampoo is made in sunny California using solar power, which sets the bar high for other companies in terms of sustainability and environmental friendliness. This could also make it the best dog shampoo for killing fleas and ticks for the eco-conscious pet owner. This flea control shampoo has a Cardoplex system, which is a combination of proteins, fruit acids, and vitamins, helping to make the shampoo easier to rinse out, plus aids in a quicker drying process after baths. 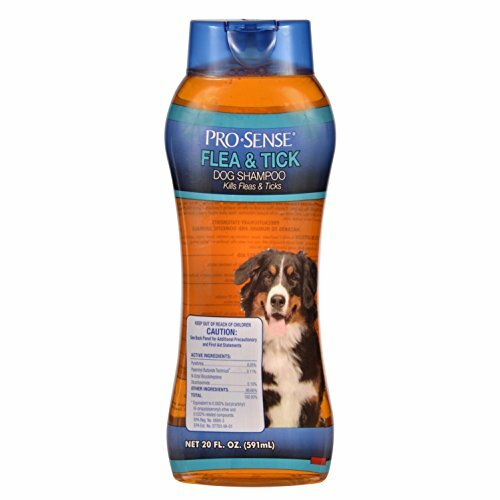 This product also promises to nourish and thicken the fur of the dog; something meant to help prevent future damage to it. Eliminates ticks, fleas, and lice in the process and results can be seen already after the first use. Why We Liked It – There are so many pet products on the market, all claiming to be the best flea shampoo for dogs, and it is great to come across a product where the manufacturer takes the environment into consideration. Safe, gentle, effective and environmentally friendly – what is not to like? Looking for an even easier shampoo? Try these waterless shampoos for dogs. Having to deal with fleas and ticks is not something any dog owner will want to do or will ever feel excited about, but it happens regardless, and when it does – it is shopping time for the right shampoo. There are so many to choose from, so what is the best flea and tick shampoo for dogs? How to choose? What to look for? The first thing to take into consideration is whether you are looking for a preventive product, one that makes sure ticks and fleas won’t want to crawl up on your dog, or if you are looking to treat a dog that already has them. Some of the best dog flea control shampoos are those that are a bit milder, provide great benefits for skin and coat and that smell good, but these are often not enough when dealing with a severe infestation. Think of what your dog needs; prevention or treatment and use that to narrow down the options. Also consider what type of coat your dog has, if he or she is prone to have a strong odor, if they tangle easily and so on, and go with a tick and flea shampoo which promises to deal with these aspects too. Does your dog have sensitive skin? Choose an unscented shampoo without harsh ingredients. Last but not least – look for a non-toxic product with quality ingredients. A flea shampoo is applied the same way as a regular shampoo – by massaging it into the dog’s coat. Don’t forget legs, paws, and tail, as well as under the belly, and use slow firm movements not to frighten the dog. Be careful not to get shampoo in their eyes or ears, as it could sting and cause ear infections. Some dog flea control shampoos require the person doing the washing to wear protective gloves, so read the instructions carefully before starting the procedure. It is recommended to leave the shampoo sitting for a minute or two for maximum effect, so keep massaging the dog in the meantime, to make it as pleasant of an experience as possible. Avoid wearing your nicest outfit as you are likely to get wet, stay positive and have bath time be a chance to spend quality time with your dog. Finally, rinse out the shampoo as thoroughly as possible, as residue could cause irritation to the skin, especially when dealing with stronger pet products. Science has taken astronomical steps forward in recent years, also when it comes to dog products and anti-tick and flea shampoo. 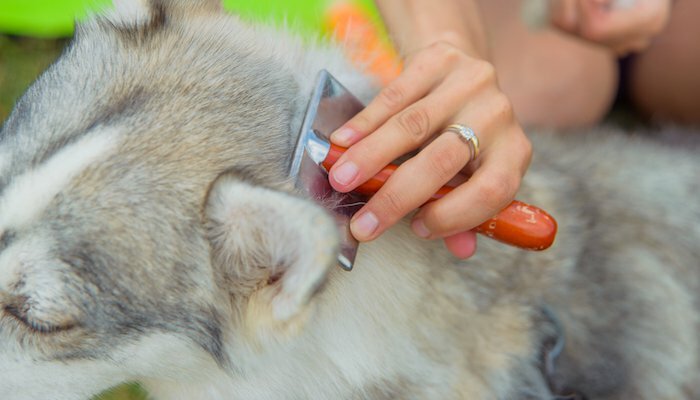 While it used to be recommended to bathe your dog only once or twice a year, due to harsh chemicals stripping their coats of necessary oils, things have changed, and natural dog shampoo now often meets the standards of shampoo for humans. 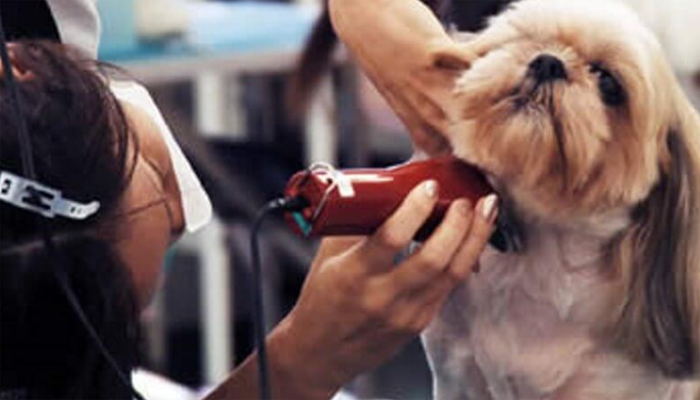 This means that as long as you buy a quality shampoo for pets – a flea bath won’t do them any harm. Today, companies use ingredients that are natural flea and bug repellents, such as lavender, which enables them to make products a lot less harmful to your dog. Products with all-natural active ingredients work very well in most cases but might have less long-lasting effects than those offering a more aggressive treatment. While fleas don’t present a direct danger; other than being rather disgusting and possibly resulting in the dog itching and scratching, they are not something one wants in your house, or worse – in your hair! 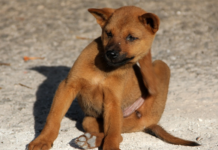 Dog fleas are not known to spread to people, but it is always better to be safe than sorry. Ticks, on the other hand, can spread a number of unpleasant deceases to the dog or person it attaches to, so it is well worth the extra dollars it costs to buy preventive pet products – such as a good tick and flea shampoo. There are no guarantees that a flea shampoo will work to the extent of which the dog owner expects because in the end no two dogs are the same, nor are the effects a flea shampoo will have on them. 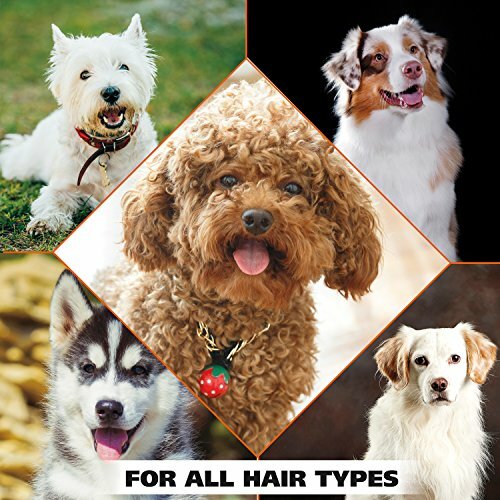 However, in general, dog shampoos to treat and prevent fleas in dogs are proven to be effective, and it is almost always a question of finding the shampoo that works for your dog. If one, for some reason, wouldn’t work – try another. It wouldn’t be in the best interest of the companies to create products that don’t live up to their promises, so it is safe to assume that dog flea shampoos do work, as long as you do your research and pick the one most appropriate for your dog and his or her needs. Yes, it is fine to use flea shampoo in dogs with sensitive skin, but it becomes more important to pick the correct type. Look for an unscented shampoo with natural flea fighting ingredients, and with features to prevent and heal flaky skin and other skin disorders. Twenty years ago, the answer to this question would have most likely been ‘no’, but with the wide selection of dog shampoos on today’s market – there are pet flea shampoos developed to fit dogs with sensitive skin. Flea shampoos are usually not recommended for puppies younger than 12 weeks, and you should consult your veterinarian if a puppy younger than that needs treatment. For puppies having passed that critical 12-week mark, tick flea treatment shampoos are generally safe to use. Read the instructions carefully and pick a shampoo with mild and – if possible – natural ingredients. It might seem overwhelming to choose a reliable tick and flea shampoo for pets, but the truth is that as long as you go with a top-rated option, you are likely to end up with a quality product. The dog industry has grown a lot in recent years, and there are now hundreds of quality options to choose from. Do your research, know your dog and choose a product that is likely to fit your needs and requirements. Protecting your dog from ticks and fleas is an investment made for a happy and healthy family life. Pay attention to the ingredients, rather than fancy looking packaging. Look for natural ingredients and components promoting not only a flea free dog but a healthy and shiny coat. Aim to make tick and flea treatment a part of your regular dog routine. A flea can live for more than 100 days without feeding, meaning they can hide in pet bedding and inside the house for a long time after the dog has received flea treatment. Always remember to wash bedding, tough dog toys, leashes, and dog harnesses frequently, to avoid the hopelessness that comes with a lost battle to fleas. Flea collars are actually a fantastic way of keeping on top of this, also. Check out this study for more advice on controlling fleas. Effectively kills fleas, ticks, flea eggs, flea larvae and lice.